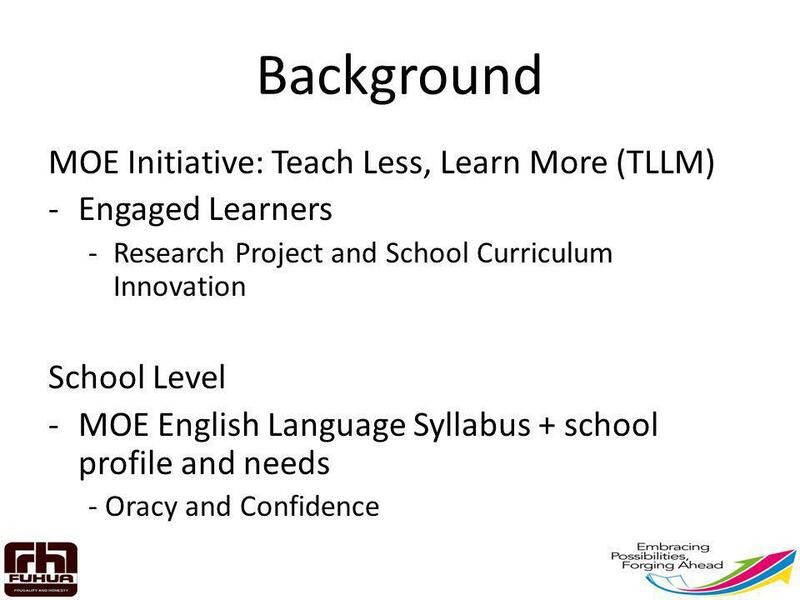 Engaged Learners Research Project and School Curriculum Innovation School Level MOE English Language Syllabus + school profile and needs - Oracy and Confidence School Level The need to develop oracy in pupils is also in alignment with the Ministry of Education (MOE) English Syllabus 2010 (Primary) that aims to develop in pupils a positive disposition towards Active Listening and Viewing. Pupils’ leadership is part of the school strategic thrust of holistic development of pupils. For a pupil to lead, one must have the confidence to speak up with an underlying condition that pupils’ contributions are recognized and valued. Data also revealed that only a small percentage lower primary pupils are speaking English language most frequently in the home environment meaning that majority of pupils are non-English speakers in social contexts outside school. The school thus hopes to build the confidence and fluency during the early childhood years through the introduction of drama within curriculum. We hope to see pupils being able to speak fluently, develop ideas and sustain talks using English Language with confidence. Therefore pupils must develop active listening skills and thinking skills which are required of a confident and fluent English Language speaker. MOE English Curriculum STELLAR Curriculum + drama techniques, exercises and presentations - Planning as a team and training the team (OJT) Strategies for English Language Learning and Reading (STELLAR) aims to strengthen both language and reading skills as well as promote a positive attitude towards reading in the foundational years through the use of well-established, learner-centred and developmentally appropriate pedagogical approaches using authentic children's literature. 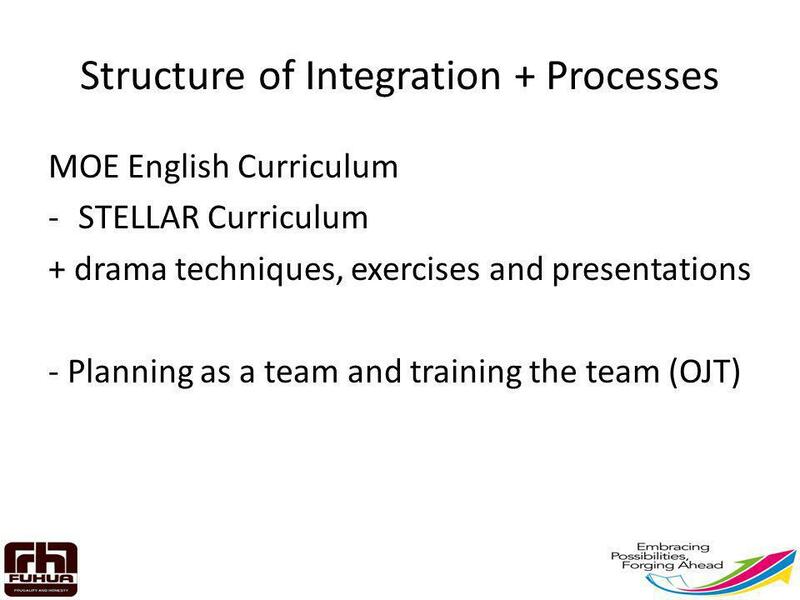 With integration of drama techniques, exercises and presentation, we extended the pupils’ use of spoken language beyond the reading. 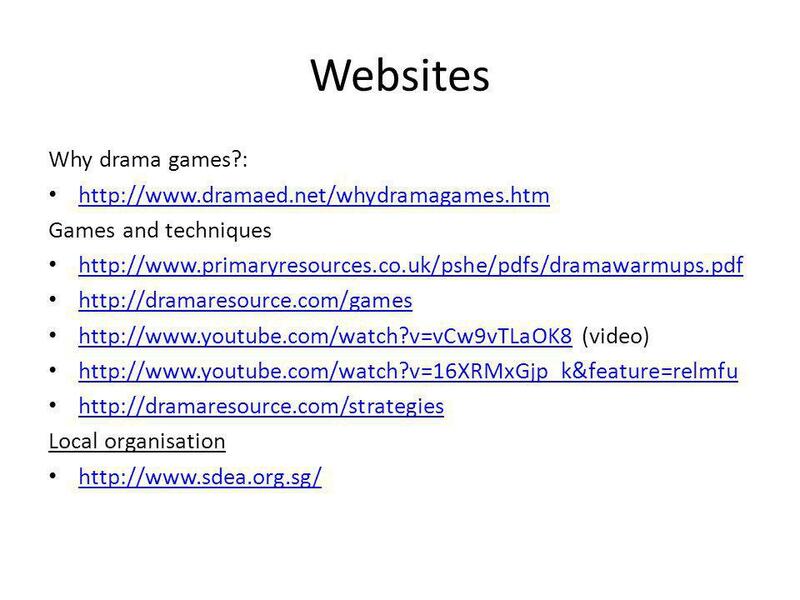 Drama fosters greater interactions between children or children with adults that involved the specific use of speech patterns and own imaginations to be engaged in the given contexts. 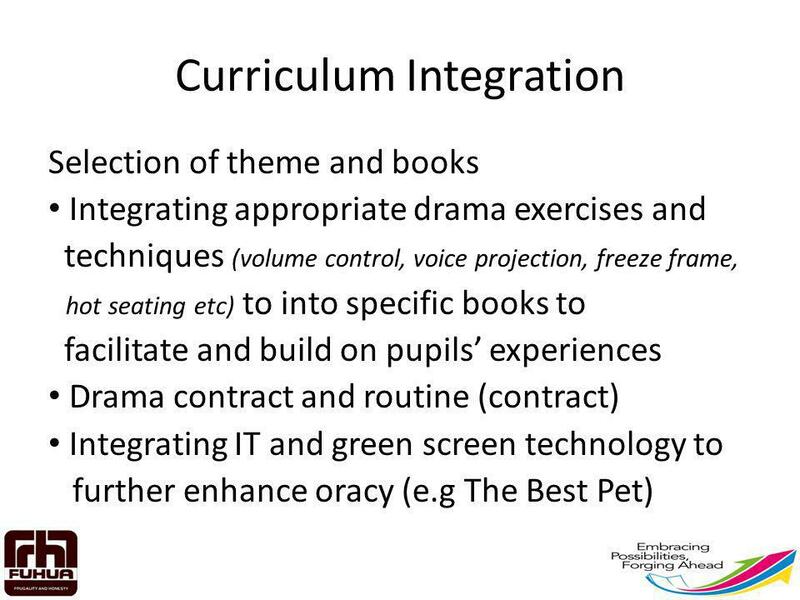 Drama within curriculum thus not only creates opportunities for creative thinking, meaningful dialogues and purposeful play, it also creates a safe environment where children’s contributions are valued and the acquisitions and learning of language are facilitated. 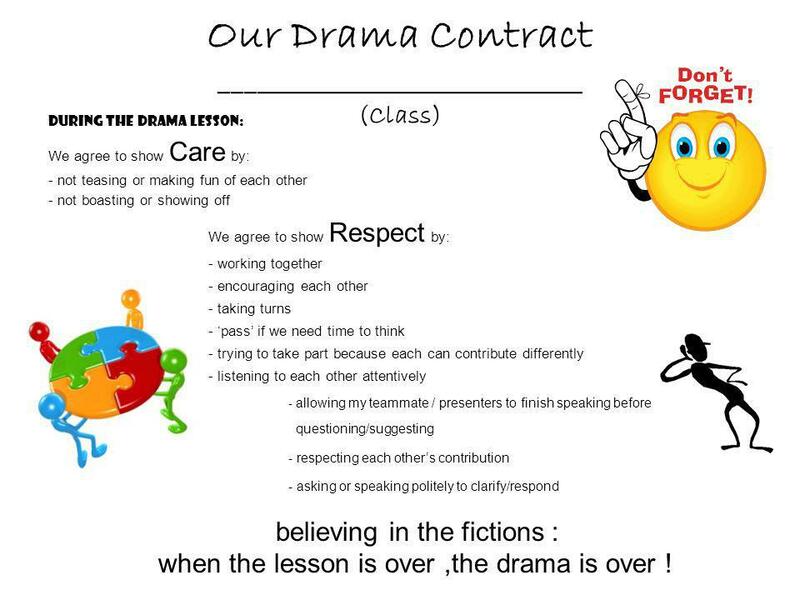 During the drama lesson: We agree to show Care by: not teasing or making fun of each other not boasting or showing off We agree to show Respect by: - working together - encouraging each other - taking turns - ‘pass’ if we need time to think - trying to take part because each can contribute differently - listening to each other attentively - allowing my teammate / presenters to finish speaking before questioning/suggesting - respecting each other’s contribution - asking or speaking politely to clarify/respond believing in the fictions : when the lesson is over ,the drama is over ! 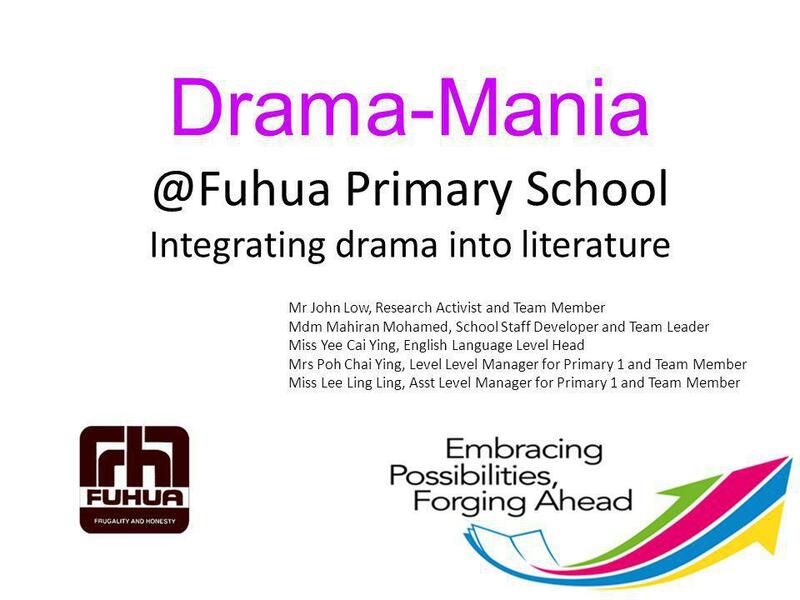 Download ppt "Primary School Integrating drama into literature"
With Eureka Primary School From Lea Green to Florida... Jacqui Johnson. Making learning (and teaching) vocabulary fun! British Council ELT Conference 22 & 23 March & 23 March 2011. Integrating Skills in EFL Class Using Video and Sound Effects Abduljabbar Alshabi IATEFL 2014 Harrogate Conference Abduljabbar Alshabi IATEFL 2014 Harrogate. - Briefing for Parents Monday 8 April The revised 2010 English Language (EL) Syllabus is implemented at Primary Four from It has been implemented. Overview What does ‘think’ mean? What are thinking skills? Can thinking be taught? What is the teacher’s role in teaching thinking skills? 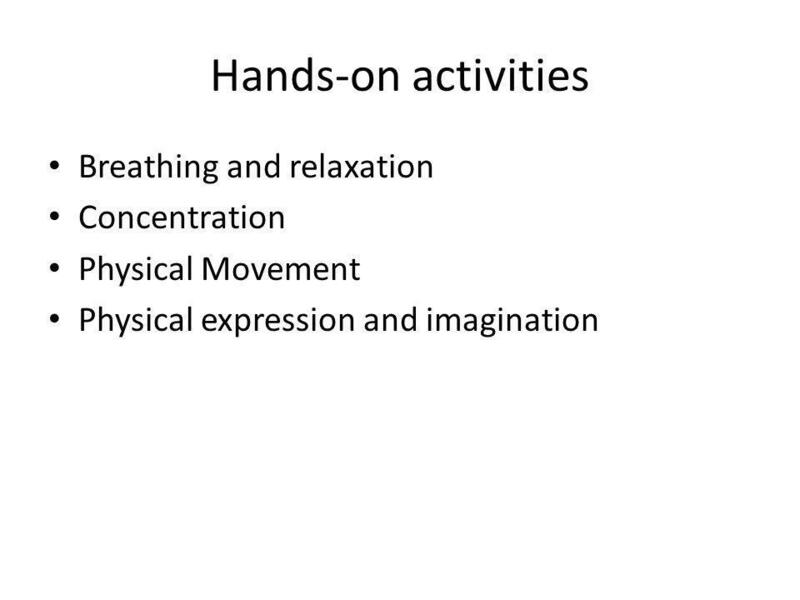 Activities Conclusions. Heroes Objectives: Explore the concept of a hero. Understand the qualities of a hero. Prepare a GCSE S&L presentation entitled ‘My Hero’. Waiver Day – Sherry Birchem Word Up! “To put it simply: students encounter unfamiliar words in their reading; they use context clues and morphology. Workshop based on QCDA Co- Development Folder Led by Brian Pengelly Primary Curriculum Conference 19 th November 2009. Studying for N5 and N4 English ENGLISH DEPARTMENT Prestwick Academy Mrs Hay. 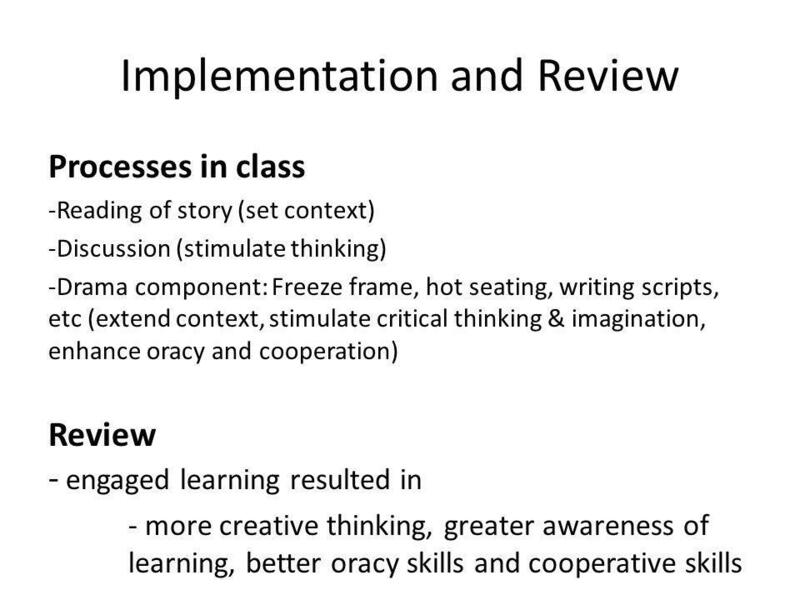 A Focus on Listening, Speaking, Reading, Writing and Vocabulary acquisition. By: Patience Adjahoe Karlsson 12 th January 2013. Nursery Curriculum Evening Thursday 10 July 2014.